We have all been there- whether we've been in a fender bender, found ourselves locked out of our car, or suffered a sudden breakdown on the side of the road. We've all found ourselves in trouble with our vehicle at one time or another. When that time comes, it makes all the difference in the world to know that you can call someone reliable who will care for your vehicle like it is their own and help you get moving again as soon as possible. With our modern self loading wheel lift system you can place your full confidence in our ability to rescue your vehicle safely from a variety of situations. Flatbed transporting covers cars, vans, trucks, motorcycles and even some commercial vehicles. If your vehicle is an all wheel drive or even a standard 4wd or you just prefer to have your vehicle transported by a flatbed, we certainly will be able to assist you. From Box trucks to RVs, We can tow it safely to the destination you choose. 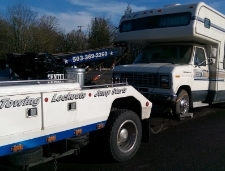 Winching, Why use a professional towing company? When you have gone off the road and the damage to your vehicle is not severe. It can be tempting to call a friend with a truck or rely on a good Samaritan to get you pulled back on the road. However there is a number of reasons why this is not a good idea. A professional tow truck operator has the knowledge and equipment necessary to safely move your vehicle without causing further damage. It is all to easy for an amateur to make a mistake and cause further damage to your vehicle, simply from lack of experience. I found this on Youtube. Don't let this be your vehicle... Please use a professional towing service. This one was also found on Youtube. This is why you should call a professional towing service.